It’s not unusual to find that some of your favorite records from wildly different artists have the same musicians playing on them. Session musicians like the Wrecking Crew in L.A. played the instruments on songs by artists ranging from the Beach Boys, the Byrds, the Mamas and the Papas, and the Monkees to Frank Sinatra, Herb Alpert and the Fifth Dimension. It was only decades later that the anonymous session musicians and their counterparts in Detroit at Motown, the Funk Brothers, gained recognition for their contributions to some of the most popular songs ever recorded. 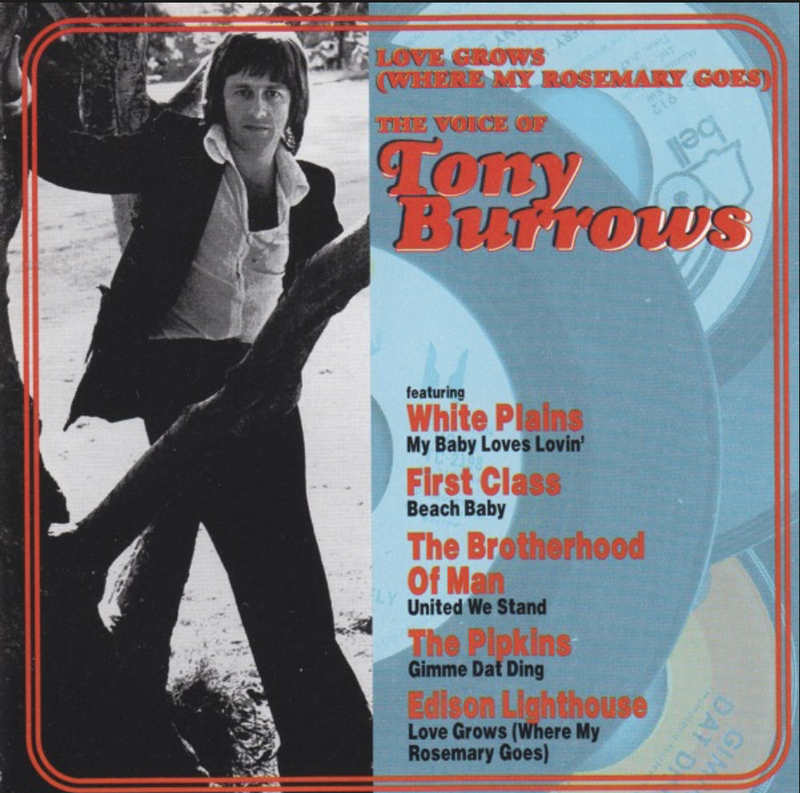 It’s even more unusual, however, to discover that some of the biggest AM radio staples of the early ’70s from a series of nearly forgotten one-hit wonders share an unheralded and overlooked lead singer named Tony Burrows. Burrows was born April 14, 1942, in Exeter in Great Britain and began his musical career in the 1950s as a member of the vocal harmony group the Kestrels, alongside Roger Greenaway and Roger Cook, who would later go on to write hits such as “You’ve Got Your Troubles” for the Fortunes and “Long Cool Woman in a Black Dress” for the Hollies. The Kestrels never had much success on their own, but they became one of the most in-demand vocal backing groups in the U.K., singing behind British hitmakers ranging from Lonnie Donegan to Billy Fury and even Benny Hill. Eventually, Tony Burrows left the group to join the Ivy League, a band that eventually evolved into the psychedelic-era group the Flower Pot Men, which also included future Deep Purple members Jon Lord and Nick Simper. The Flower Pot Men first hit the charts in 1967 with the California-influenced “Let’s Go To San Francisco,” a #4 hit in the U.K. 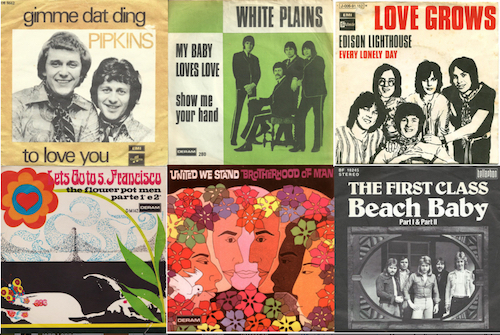 The song (which failed to chart in the U.S.) has long been a staple on flower-power compilation albums, joining Scott McKenzie’s “San Francisco (Be Sure to Wear Flowers in Your Hair)” and Eric Burdon and the Animals’ “San Franciscan Nights” in crowning the city by the Bay as the hippie capital of the Summer of Love. A few failed singles and a few personnel changes later, and the Flower Pot Men morphed into White Plains. The new configuration of the group called on Burrows’ old bandmates from the Kestrels, Greenaway and Cook, for their first major hit—this time on both sides of the Atlantic—with the #13 “My Baby Loves Lovin’” in the summer of 1970. That year turned out to be the highlight of the young singer’s career as Burrows handled lead vocals on hit singles from three other groups: “Love Grows (Where My Rosemary Goes)” by Edison Lighthouse (#5, U.S.), “United We Stand” by Brotherhood Of Man (#13), and “Gimme Dat Ding” by the Pipkins (#9). In fact, Burrows made history that year when he became the first and only performer to ever appear on the BBC’s Top of The Pops three times in a single program with three separate groups, a feat that got him unofficially banned from the program when the producers thought that something fishy might be going on. After his BBC trifecta, Burrows unsuccessfully tried to get back on the charts under his own name, releasing a series of records that all failed to make a significant dent in the public consciousness. His hit-making days weren’t over, however. In 1974, he scored another top five hit in the U.S. under yet another band name, the First Class, with “Beach Baby,” a song so reminiscent of the Beach Boys that you expected to see a Brian Wilson songwriting credit on the label. Despite the fact that he never got the name recognition that other pop stars of the era would earn, Burrows still lays claim to the title of the only one-hit wonder who did it six times. It’s a title that’s unlikely to ever be matched. The videos referenced in the article might confuse readers because Burrows is not always performing as the lead singer, even though it’s his voice which is being lip-synced to. In “Love Grows” and “United We Stand”, he’s the lead singer. But in “My Baby Loves Love”, he’s a background singer while Roger Greenaway lip-syncs to Burrows’ voice. And Greenaway appears in “United We Stand” as a background vocalist. Tony doesn’t even appear at all in the “Beach Baby” video. That’s Del John lip-syncing to Burrows’ original studio recording. The remaining two videos have no performance footage, but it’s well known that Tony was lead singer on both recordings. Tony didn’t sing lead on “My Baby Loves Lovin’”. Ricky Wolff, who had replaced Neil Landon in the Flowerpot Men, sang lead on the studio recording. Rick didn’t want to front the band on TV, so Roger Greenaway stepped in. The Tony story was just to sell records. Tony won’t let go of the story. The band themselves stated it wasn’t Tony on lead in a 1970 NME article. Roger Cook also confirmed it was Rick on lead during a podcast interview last year. In that case (see comments on him NOT being the lead singer on all six songs mentioned in the article, you can make a case for Paul Carrock with a string of hit/charting vocals on songs for four different bands. I won’t spoil your fun. Look it up! yeah, Paul Carrack ya mean>? saw him w/ringo in ’03, gr8 singer/key boardist! !